eat run sail: My Weely Recap.. Such as it is! It was a challenging week fitness-wise. I knew it would be. We packed up the car with items from the boat, cleaned the house basically from top to bottom before we unpacked and put away our stuff, and have been shopping, baking and cleaning ever since. It has all been a lot of physical work in itself, but I did manage several walks and some aerobics. Nothing to brag about by any means.... but on the other hand, I could have just done nothing and so all in all, I am satisfied.... and glad it's over! And I am happy to say that the sun is shining and we are about to head out for a run... hurray! This is a lovely shortbread squares recipe that I posted on my food blog yesterday. 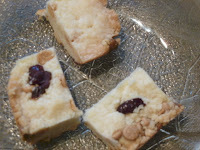 So easy and a nice twist on shortbread with the dried crans and white chocolate chips. I bet its nice to get the house cleaned and in order and getting to cook a lot again! I think you had a nice week and I am sure that all that stuff was physical so I count that as a great week for you! You have been active! Im going to take a look at your shortbread! Great job getting out there! Walking that kind of distance is not easy and you did it consistently! Great job! You did awesome! I love how you always find a way to get something in!